Celebrated author, essayist and Judaic studies scholar, Barbara Kirshenblatt-Gimblett will be the featured speaker for the 2016 B.G. Rudolph Lecture. The annual address, sponsored by the Jewish studies program in the College of Arts and Sciences, will happen on Monday, April 11, at 7 p.m. in room 010 of Crouse-Hinds Hall. The event is free and open to the public. CART transcription services will be provided. 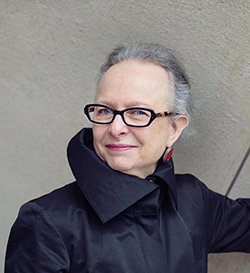 In a lecture titled, “Rising from the Rubble: Creating POLIN Museum of the History of Polish Jews in Warsaw,” Kirshenblatt-Gimblett will discuss her role as the chief curator of the core exhibition of the new cultural center, and her reflections on the process of creating a physical space to honor the rich thousand-year history of Jewish heritage in Poland. The museum stands in what was once the heart of Jewish Warsaw—an area that the Nazis turned into the Warsaw Ghetto during World War II. Kirshenblatt-Gimblett is also a professor emerita of performance studies at the Tisch School of the Arts at New York University. She also is an affiliated professor of Hebrew and Judaic studies in its Graduate School of Arts and Science. Her scholarship reflects the intersection of Jewish studies, performance studies and museum and memory studies. Her many books include “Destination Culture: Tourism, Museums, and Heritage”; “Image before My Eyes: A Photographic History of Jewish Life in Poland, 1864–1939” (with Lucjan Dobroszycki); “They Called Me Mayer July: Painted Memories of a Jewish Childhood in Poland Before the Holocaust” (with Mayer Kirshenblatt), “The Art of Being Jewish in Modern Times” (with Jonathan Karp), and “Anne Frank Unbound: Media, Imagination, Memory” (with Jeffrey Shandler). Throughout her illustrious career, the Canadian native has been recognized countless times for interdisciplinary contributions to Jewish studies, as well having been highly sought for her expertise in the realm of museum and exhibition projects. Prior to her work at the Warsaw museum, Kirshenblatt-Gimblett served as president of the American Folklore Society and, most recently, was decorated with the Officer’s Cross of the Order of Merit of the Republic of Poland by President Andrzej Duda for her contribution to POLIN Museum. Kirshenblatt-Gimblett’s presentation is a part of the B.G. Rudolph Lecture series that was created in 1973 by Bernard G. Rudolph in order to bring distinguished Judaic studies scholars to SU’s campus. For more information on the program or the lecture series, contact Professor Zachary Braiterman, Jewish studies program director, at 315-443-5719.